On finishing The Iliad, I decided (naturally enough) that it was time to read something a little lighter, so my eyes landed on one of the Roddy Doyle books sprawled across one of my long-suffering bookshelves (note to self – operation Bookshelf Overhaul is long overdue!). Most people will have heard of or read (or, more likely, seen) Doyle’s The Commitments, the first of the Barrytown trilogy (also the setting for Paddy Clarke, Ha, Ha, Ha), and The Van is the third of these novels. Set in Dublin in the wondrous year of 1990, amidst the backdrop of the Republic of Ireland’s first trip to the World Cup (something more important than non-football followers could ever imagine), The Van takes Jimmy Rabbitte snr. as its main protagonist, following his experiences from unemployment to setting up a mobile fish and chip shop, the van of the title, with his best friend, Bimbo. It’s written in Doyle’s usual funny, yet profound, style, giving us an insight into the day of a man who, undereducated and unemployed, has been left to make his own way through the week, drifting from the local golf course to the park, with the occasional pint or two in the evening when he can afford it. The reader can really empathise with Jimmy and his struggle to adapt to time spent alone after an adult life of work (although I, for one, would be quite happy with a bit more spare time), and his attempts to make himself useful to his family are faintly noble. While the gradual breakdown of a lifelong friendship and the nostalgic joy of reliving the halcyon days of Italia ’90 made this a pleasure to read, the enjoyment of this novel was tainted at times by the handling of the role of women. Jimmy and his friends have a voyeuristic tendency, and women (and some girls on the cusp of attaining womanhood) are used mainly as objects to be ogled – and later pursued. I’m not doubting the reality of what Doyle has written; it’s easy to believe that someone of a certain age, in a time and setting far from today’s, would act as Jimmy would and not really think anything of it. It just made me feel a little uncomfortable (and I have seen a couple of reviewers who have agreed with me). That may well have been the point, but this book could well have done with a little more female perspective. Where I felt sorry for Jimmy towards the start of the book, by the end I was a little ambivalent towards him and his greasy endeavours. Which is a shame. One author who never finds me ambivalent is Thomas Hardy, whose works I started reading again last year (and will continue to enjoy in 2010). After the rolling farmlands of Far from the Madding Crowd and the ominous heaths of The Return of the Native, this time it is the woody glades of Wessex which take centre stage in his novel The Woodlanders. It’s a lovely little read, if not a patch on his major works, and, as always, you can almost imagine yourself transported to the leafy glades by Hardy’s measured prose (even if he never uses a couple of short words where a complicated – and occasionally invented – Greek-based word will do). The book abounds with love triangles and unrequited passions, and the moral seems to be to choose wisely before rushing into wedlock, especially if you’re marrying above/below your station. Hardy also reflects on the unfairness of the law, particularly as regards the differing ease with which men and women were able to obtain divorces in olden days (I wonder if he’d be happier now…). Something to reflect on when remembering your wedding vows. Where Hardy is restraint and pastoral calm, my most recent book is passion and despair, usually in equal and mixed up proportions. Just as you may have heard that some bloke called Shakespeare is a fairly famous writer of English, you’ve probably come across the name Goethe in the context of German literature. As an avid reader, and a modern languages graduate, I am a little ashamed to say that I had never read anything by the great man – until now, that is. This novel is one of the most famous Sturm und Drang works, and it is certainly stormy. On reading the first part of the novel, I was blown away by the intensity of the writing and the openness of emotion which Goethe breathed into his literary alter-ego. Werther is actually a mixture of the young Goethe’s own obsession with a young woman called Lotte and the fate of a friend who ended his life at an early age. Although embarrassed by this early work later in life (he was only 25 when he wrote this – bloody geniuses…), it was an instant Europe-wide hit and found many admirers and Werther copycats. Of course, the church was not so happy with Goethe as some of those copycats went a little too far; in fact, the work was seen as an apology for those committing suicide. A word of warning for anyone wanting to read this book in German; written in 1774, you may be a little surprised by what you see on the page. The original text varies ever so slightly from modern German, with several common and consistent spelling conventions different from today’s, slight grammatical variations and a few vocabulary peculiarities. In fairness though, once you have waded through a few pages (removing redundant ‘h’s and swapping a few vowels around), it is surprisingly easy to read, provided you have a fairly high standard of German (and a high tolerance for chest beating, hair pulling and teeth gnashing). Is it any good? Definitely. The prose is breath-takingly vivid at times, and Goethe drags the reader along as Werther swings between the highs of his halcyon days in Lotte’s company to the lows of his attempts to come to terms with the impossibility of his desires. While the cynic in me did at times long to give him a slap and say “get over it, you cretin”, it was a small voice at the back of my head and was usually drowned out by the passion Werther poured into his outbursts of grief and declarations of love. 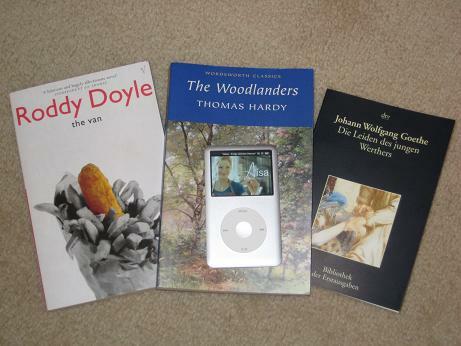 From the sublime to the ridiculous we go as I explain what that i-Pod is doing amongst the books in my post photo. Well, having eventually succumbed to the temptation of upgrading my trusty, battered old i-Pod Mini to a sleek new Classic before Christmas, and having finally got around to upgrading my internet connection to Broadband, I am now able to download video podcasts (and able to time that process with a watch rather than a calendar). Which brings me to Alisa – Folge deinem Herzen (Alisa – Follow your Heart), a telenovela which has been running on the German channel ZDF since March last year. Now, you may not think of me as the type of person to be obsessed with kitschy telly programmes (and you’d be right – I’m far too intellectual for all that. No, really…), but watching rubbish is a great way to practice languages. I think I got more from watching a couple of years of the soap opera Unter Uns than from three years of German at university. As a language teacher myself, I encourage students to watch programmes like Neighbours and Home and Away as they model the kind of language people use every day – and there’s a limit to how much news the average language student really wants to watch. Anyway, Alisa runs for about 40 minutes every day, Monday to Friday, and follows the trials and tribulations of Alisa Lenz, who has come back to live with her adopted parents in the small town of Schönroda after a failed business (and relationship) in Berlin. The angelic-looking Alisa, played by Teresa Scholze (who, were she British, would be a certainty to be playing Cinderella in pantomime next Christmas), stumbles across Christian, a sensitive, good-looking man (I don’t know the actor’s name, but I bet he’s played Prince Charming a few times in his career) who happens to be the son and heir of the powerful local Castellhof family. Can you see where this is going yet? In her first week in Schönroda, Alisa manages to seriously annoy Christian’s uncle (who is then revealed to be the one interviewing her for her new job), save Christian’s sister from drowning and get on the wrong side of Christian’s fiancee, Ellen (who, conveniently, is as dark and brooding as Alisa is blonde and bubbly; good witch – evil witch, anyone?). Throw in a stereotypically over-exuberant Italian woman who, despite speaking perfect German, has a huge accent and starts every sentence with an Italian word, a mean supervisor who has been instructed to get rid of Alisa at all costs and a family doctor who appears to be keeping a dark secret about one of the Castellhofs, and you have the set-up for the rest of the show. Oh, did I mention that Alisa accidentally saw Ellen in flagrante with Christian’s Uncle Oskar in his office on her first day of work? Now if this series does not end in a wedding, I’ll eat my i-Pod. While it’s depressing how low your standards sink when you’re looking for free programmes in a foreign language, I must confess that it’s all good entertainment. Yes, the dialogue is stilted, the characters are caricatures, and everyone has more secrets than I could hope to accumulate in a lifetime. Still, it’s a pleasant way to while away an idle hour, and we can’t be reading Goethe all the time now, can we? Everyone has their guilty secret… mine is J-pop and J-dramas. But I seriously believe watching tv is the best way of learning languages, it's how I learnt my Japanese.I have to admit I haven't read any Goethe either, although I did check it out of the library once in college. But I don't think I got beyond the first few pages. But it's on my perpetual tbr list. Same with The Illiad, The Divine Comedy, Paradise Lost. The list is endless.I went through a Thomas Hardy phase at school and remember really enjoying Tess of the D'Urbervilles and The Mayor of Casterbridge. If my guilty pleasures were in another language, I think I'd feel a little better about them. In college I took a class on European novels. As I recall, every single one involved at least one suicide. I think part of the brilliance of _The Sorrows of Young Werther_ is it's length. Yes, it's melodramatic, but just about the point you think, "This can't go on anymore," it ends. I'm thinking about doing a big Goethe reread this year myself, and maybe do a two week roundup. Maybe that's beyond me, though – he's such a complex writer. I'm impressed with your reading the German originals. I'm simply too lazy these days. I reread Werther last year and was much more impressed than I was 30 years ago. “Elective Affinities” is next as I'm planning a trip to Weimar in the near future. I try to read something in French and German each month to ensure that my undergraduate degree wasn't a total waste of time. Favourites since I started my blog include Heinrich Böll, Franz Kafka, Erich-Maria Remarque and Albert Camus. Oh, I loved “The Sufferings of Young Werther” (that sounds a bit cynical viewed from another perspective doesn't it? ), I may have even cried a little. The book I had was an English translation and I thought it was very good, but then I don't speak any German so I don't know how faithful to the original it was. I enjoyed your review, it reminded me I should read more of his books. Thank you for translating that, it definitely sounds like a mouthful. Never been much into poetry but I'm working on that. I do like E.A.Poe's verses… Next year I'll try to be more adventurous reading-wise.